For more than a week, I have been trying to grasp exactly what I want to say about Meek’s Cutoff. My head has been swirling with many thoughts about the story, characters, performances, direction, and cinematography. What is it all working towards? 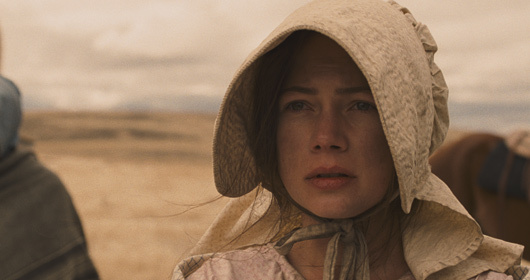 Fundamentally Meek’s Cutoff is a revisionist Western that centers on the lives of women as they cross the Oregon High Desert with their families. The group is led by guide Stephen Meek (Bruce Greenwood) who may be leading them no where. Tensions mount as water becomes scarce and the two-week journey becomes more arduous. When the group encounters and captures a Native American (Ron Rondeaux), the film shifts from a story about survival to a story about gender differences and fears of an ethnic other. 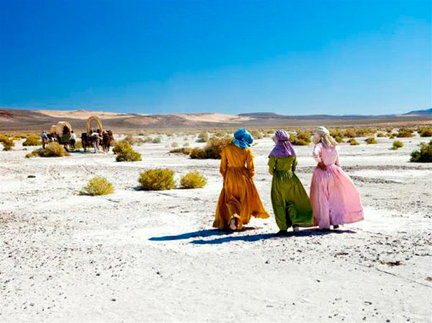 The women, played by Michelle Williams, Shirley Henderson and Zoe Kazan, represent three very different types, visually marked by the contrasting colors of their dresses and bonnets. They differ in age, are in different stages of their marriages and have different levels of individual agency. They are given little authority to make decisions although their work – cooking, cleaning, minding the children – is no less important. That fact that director Kelly Reichardt focuses the film on these women emphasizes that their presence is more important than their male counterparts. We never hear the conversations these men have about what to do with their wayward guide or the Indian. It is instead the women, their conversations, their solidarity with one another, and above all their morality, that drives the narrative. A scene like this is one of many that evoked Julie Dash's Daughters of the Dust. Meek’s Cutoff is less about its characters and performances (Williams’ character is the only one with any depth). It is more about how this story is stylistically told through realist tendencies and a slow, methodical progression. I can’t help but turn my attention to the other post-9/11 independent films that fascinate me and how Meek’s Cutoff relates. Like Reichardt’s 2008 film Wendy and Lucy, Meek’s Cutoff explores notions of identity. Yet the historical context of Meek’s Cutoff causes this exploration of self to encompass many complex layers. Gender, class, and Americanism all play a part in how the settlers exist and define themselves. Most telling is how these white settlers pit themselves against the non-white other emphasizes the early foundations of a long-standing American fear of the other. Kazan’s character Millie is a hysterical woman convinced that the Indian will kill the group; her hysterics are matched by the actions of the men. In a way this is on par with Courtney Hunt’s Frozen River, which places the fear of an ethnic other in a contemporary setting, a setting that revolves around post-9/11 anxieties. Meek’s Cutoff seems to ever so slightly offer a commentary on current relations with immigrants and how we define ourselves against someone else. This post is a part of my ongoing Thesis Redux project. More here on the films I will be watching and writing about. this was a really interesting piece. thank you. i’m not going to run out and watch it but as a film graduate myself i can appreciate your feelings towards what to do next and the longing to continue writing about something you have a passion for. i’ll look forward to reading as you continue. Thank you! Hopefully I can actually be more productive with this project than I have been. Great post! I was wondering what you were going to say about ‘Meek’s Cutoff.’ My thoughts exactly — only put down way more eloquently! It’s a shame you think that. I found Meek’s Cutoff to be very realist, which is why the story picks up in the middle and ends without any real conclusions. That’s life, then and now. This can be off-putting for someone who seeks a more traditional narrative structure and character development. I don’t think the production ran out of money; it was very bare bones, which is completely representative of Kelly Reichardt. Have you seen her other films? Maybe give them – I especially recommend Wendy and Lucy – a shot? Thanks for commenting!